The only venomous snakes on this page are the Cottonmouth and the Rattlesnakes and should be left alone. All the others on this page are considered harmless to humans. Watersnakes, racers and a few of the other non-venomous snakes will bite if cornered or handled, but if given the chance will just try to go away from you. Looking to ID a snake with light brown body color on top with sharp copper stripe running length. Snake was small and appears to be juvenile, no idea of belly color or overall length as it was shy and went under crawlspace but hanging out at c/s door. The most beautiful snake I've ever seen was sunning itself beside the front door stoop of my house in S.E. Michigan one day, when I started out to walk my dog. The dog never even noticed it, but the snake was obviously panicking as it quickly fled from the dog. I still got a good look at its back: it was a black snake about two feet long, and each of its scales reflected the sun's light as a spot of iridescent blue in the middle of the scale. I've never seen such a pretty reptile before or since. Only wish video-phones had been invented back then; maybe I could have thought fast enough to have gotten a picture. I just watched a tan snake with rings crawl across the pool deck into the pool then raised its head and swam like zigzagging across the pool. it turned black in the pool. Its only about 18 inches long, very slender. We are seeing a black snake 4-5 feet long with tan lines that make a square or rectangle on its back about every 6 inches. This snake has red pits in front of its eyes. It has the head of a king snake. Does anyone know this snake? Does anyone know if there are eastern milk snakes in the texas panhandle? I saw one that had very similar patterns on it today but I haven't read that they are around here. I found a snake yesterday that was brown, with a white belly, and had red markings on it's back. I thought it was a copperhead, but I didn't see the triangles shaped head, or fangs when he struck out. The marks on it's back were almost square. Can anyone ID this snake? Sounds like the black and gray snake you almost stepped on is a black rat snake. I just almost stepped on one that's black and grey on top and white on the bottom, and can't find a pic to know exactly what it is. This thing I saw was on my kitchen floor. I looked like a red ribbon. My house is built tight and I do not know how it got in my house. I found a snake that was dark brown with white diamonds, the diamonds had a forrest green inside them and brown in the middle, wht type is that? I am looking for the white milk snake with large brown spots, does anyone know where is it found? Hey, I've been raking my sister's yard and I have let several piles of leaves standing in the back yard. The piles have bern there since Tuesday of this week. Yesterday (Saturday), I finally got around to gathering up the piles and putting them next to the road. While I was raking a pile onto a tarp, I turned over at the bottom of the pile 2 small baby size snakes. They had real white bellies and when in the sun, they were a bronze, copper like color but with no distinct patterns emerging. I am from eastern central north carolina. Can anyone help me with what they might have been. It's December and just turned real cold last night. I thought snakes went and his at the first sign if winter. Obviously not, huh? I have a snake problem and no one can tell me what they are. They are fairly big about 3➕ feet long solid black and they look like they have horns. They hiss at you. I am terrified of any kind of snake and I have had several run ins with at least 2 different ones,but the same kind. I don't really want to kill them. But if they are venomous then I need to get them removed. If anyone knows what they are please help. We seen a black snake with white spots and was wondering wondering what kind it could be and if poisonous, we live near Charlotte n.c. I live NE of Atlanta. Last year I saw a glossy jet black snake with a bright red stripe down the middle of the back starting at the base of the head. I assume it was a juvenile as it was only about 8" long. I live next to a pond with lots of frogs, etc. It wasn't like any black snake I have ever seen because of the bright red stripe and it was solid black. Anybody know what kind of snake this is? Do garter snakes have a solid dark glossy black version with a bright red stripe? i live in south central Missouri and have found a 10 - 12 inch black with white sculptured python type design n a blue green sparkly bottom. I cannot identift this at all. We have a black all around with a lime green stripe down its back about 6-8 inches long. What could this be is it venomous. We have a 2 year old. Small fairly bright green snake with thin black bands over entire body....appeared in garage in Central New York. Trying to figure out what kind it is....haven't seen any similar snakes pictured. It appeared to be a young snake, not more than 10-12 inches? sons caught a small bright red snake in our driveway today.. we live in SC.. any ideas? I was thinking a work snake? the coloring didn't match any of the above pics though..? I got a black snake with a red/ orange belly that's extremely aggressive . South Carolina. I want to know if it's poisonous . It hisses to. About to be a dead snake? I saw a snake that had black and green diamond skin a couple months ago. Was just wandering what it was . I live in Texas. just found a snake 1 hour ago curled up on top of a box on a storage shelf of kitchen stuff almost stuck my hand right on it looking for brita filters notreal big but black and turquoise blue what the heck kind is it? I caught a bright red snake that was silver underneath and had lime green eyes. There weren't any patterns on it, it was thin and smooth scaled, and fairly small. When I picked it up, it just crawled around my hand and didn't seem threatened at all. this was in central California. does anyone know what kind of snake it may have been? michelle, near Abilene, this is Lee and I think we have the same kind of snake and I have no clue what it is but I can guarantee it is dead. in Ft. Worth, Texas, small with black on top and yellow to red, dotted belly, pointed head. this morning I saw a dark silvery snake with tiny white spots and a red tip on his tail. It was a creature creature. I live in VA and I have no idea what type of snake this is; based on the little research I've done. I found it while on a run in the woods at a Battlefield near my house. Very small, almost leopard-like dots on the back (black around the edge and light cream interior) and a black, line across the nose past the eyes. I found a little snake with brown coloring and white blotches or spots on its back! I live in the country and feed the critters occassionally including some turtles. One day I watched a female turtle lay eggs in two different spots in my front yard. A few days later a black snake with green iridescent rings was trying to dig up the turtle eggs. I haven't been able to find pictures of these snakes any where! by the way I live in florida. I found a snake that had a black stripe down it's back and it had white spots or stripes on it's head it the snake was in my hot tube and it was trying to get out what type of snake is it? plz tell me. Found a flat bodied u-shaped snake by the river and ive lived in the hill country for years and never seen a snake like this. Looked very disturbing. My husband was mowing and must of hit this snake that is about a foot long bluish green and black stripes any idea what it is? I live up in Northern Ontario in the Elliot Lake area. I saw a snake that was orange in colour all over its back. It had a solid black head. The orange colour was solid with no stripes anywhere on its back. Does anyone know what type of snake this could be? Well a week ago i started to pick up wood cause my parents wanted to pick it up to cut the grass. But when i pick a wood i found a Yellowish snake with a almost star looking mark around on top of its head. So umm. Can someone tell me what snake is this. Cause i am afraid that it could be a deadly snake. And it looked like it was somewhat smooth scales on it. I found a snake today and doesn't look like anything I've seen can someone tell me what it is? I just shot a snake with a greenish black diamond pattern with yellow trim in between. It had a yellow belly was about 4ft long and a diamond shaped head. A snake came out onto the path which had solid red from the tip of its nose which extended for eight inches along its body then turned solid green. The snake was about six feet long. It showed no fear and was curious and aggressive. This happen in the jungle coved mountain of Vietnam 1968 and I have always wonder what kind of snake it was? I have a friend that lives in Maine near the Connecticut River. He thought he saw an Anaconda. Is that snake now in Maine? I bought a snake off a yard sale it's 7 feet long oval almost diamond shaped head vertical brown eyes large long shaped bodie two toned color it's design is diamond with light circular dots in the middle. Inlet could find one picture and it didn't have a name. I caught a snake in my yard (aiken, South Carolina) over the weekend that I've never seen one like it and can not find a picture of one on the internet. It was approximately 24 inches long, solid light yellow belly, and the entire body was evenly black/brown/yellow speckled. Can anyone identify this snake for me? Hi I live in the mountains of Virginia and saw a snake the other day I had never seen before. It was black with white markings but it had its head up like a cobra would and even slithered away with its head still up. The underside of its head was white and the snake was at least five feet long. Everyone I mention it too thinks im crazy but my mother was with me and saw it too. What kind could it be? Great site - thanks so much. Found two snakes in the wood pile today - they are baby northern ring-necks. SW Indiana, Knox Co. approx. 1:15 P.M. I was walking to the garage when suddenly something caught my eye. It was a solid, dark blue-green color snake, about 2-2 1/2 ft. in length. Body was was about as big around as a silver dollar, and had a slight shiny appearance. Last 6-8 inches (tail) was just a little smaller than the average little finger. It moved rather fast, covering a distance of about 13-15 ft. in about 2 seconds, and then disappeared under a low branched tree in my rock garden. It scared me because it appeared suddenly and moved so fast. I do not remember seeing a snake on my farm property this color before. It may be because of the drought conditions we have had this year. I have heard of blue racers and black racers around Indiana, but do not know the exact hue of their color. ????? I found this small (im guessing its a baby) snake. It is 16 to 16 1/2 cm. Its a little bit light darkish red. It has a light dark brown head and from above halfway of the chest is its red belly. I have pictures of the snake if you need a better description. Hello, my friend lives in missouri and was suprised when she opened her shed to find a big snake sitting there. it whipped around and stared at her while flicking its tongue around. she did not see any large fangs so she got brave grabbed a shovel and whacked his head off. the snake didnt just wriggle around its body was hoping around the shed very agressivly. She said it was a black snake with a yellow belly and yellow stripes on its sides and it also had red diamonds on its sides. She has asked all over Buckner and no one knows what it is. The mayor is coming out because they are afraid its some weird new species. do you know what it could be? I live in West Texas just outside of Abilene,,I just found a baby black snake with orange around the neck and yellow belly and darker orange near the tail,,just need to know if anyone know's what type of snake it is, I live on a 3,000 acre ranch and we have lots of bull snakes,rat snakes and rattlesnakes,,just need to know what type it might be because we have lots of small children and pets. I was replacing railroad ties in my driveway and found a family of snakes. They were black with red and yellow rings. I live in New Jersey and am curious as to what kind of snakes they are. If you can help me, please do. Thanks. Just found a small grey/charcoal snake approx 20 cm long. It had a very black, diamond shaped head. Unfortunately, i didn't have a camera at hand. on close instpection, it's back was patterned with small white dots. Caught it and released it into nearby bushes. Any ideas as to what it may have been? Snake crawl on top of my feet. Want to know what type of snake is it. Has a black body, black head, black belly, with two yellow striPs on its back. Im in south west Texas. I think it might be a garter snake but this one had black belly and a black head. Let me know. I just killed a snake about 5' long and it is brown on top and white on the bottom.It has no other dimonds,lines,etc. on its back and has a oval shaped head.I have a 61 year old grand maw that lives here and im over here alot shooting birds and squirrels.My pawpaw just died and he would normally tell me but since hes not here please tell me wat kind of snake this is.P.S I live in Louisiana. I live in Tyler TX in the city and found a six inch long dark grey snake with a white belly and a black line down the middle of the back. I can not find it on Internet. Any clue as to the kind. Its head was not shaped liked a viper. It was more oval shaped. Any help will be appreciated. Shasta County, Northern California; I keep finding 5" long snakes, dark on top, silver underbody in my house. I find one to two at a time and they are always the same size and color. There have been eight so far this year, the last one was found in a bedroom last night (Oct 13). The Ag dept mentioned Black and/or Rubber Boa, but cannot find picture of the ones I have. They do not deviate in size or color no matter what time of year so they must only grow to 5". HELP!!! i found three small, looked like baby snakes, about 2 inches long and they were a dark brown or maroon. We live in West Virginia- what do you think they are? Forgot to add it was found in Northeast Arkansas, cotton farm outside city. About dark on our south brick patio beneath a door were two small sllick bright green and dark brown banded snakes. Head appeared to be flat or chizel shape. Light rain today, surrounded by cotton fields and drainage ditches. I'm working out in west texas and lastnight i came across a baby snake. I was wondering what type it was. It was only about 1 ft long, grey to dark grey with one row of black diamonds down its back. I was in Ormond Beach, FL, this a.m. & saw a fat snake a little longer than one foot long, black with white spots on its back. Do you know the identity of this snake? I was in the NC mts and came across a small black snake with a pretty bright blue stripe across its head. Do you know what kind it is? I live in southern Indiana and when I was a child around 40 years ago I remember playing with green garden snakes, now I have not seen any for at least 25 years. Have they gone extinct in this state or have they just moved on. my daughter was in hamburg ill this weekend and she saw a snake that was green with nlack strip's. Could you tell me what type of snake it is? In that area anyway's? I wasn't able to download the picture of snake in question.I found it and will like to keep it lol. A couple of years ago, we killed a snake in our back yard. It was neon green with black checkers down its back (rough scaled) with a bluish belly if i remember correctly. It had a head similar to that of a rattlesnake (diamond shaped) it had fangs as well. Very agressive, fast striker. Closest picture i have to its match was an asian pit viper. We were living in Winter Haven Florida at the time. Any pictures or idea what kind of snake this was? i was out side and i seen a brown snake about 2 of them slithering in the rocks where we have a garden and grass but also live on the hillside of fremont ca i was wondering if that is a posinous snake i have kisds and im sure the mama snake isnt far.. help the sknae is over a foot long already. This morning as I walked across my carporch I saw a small snake about 6 - 8" long beside the steps leading to my pool area. I was in an area that was once a flower bed but now has only mulch, leaves. The snake was very light grey with an almost black head that seemed to resemble an arrowhead. about half way down the body there were dark or black spots that led to a black tail. As I approached the snake it's head seemed to be hooded like a cobra and as it crawled away it seemed to loose the hood somewhat. I went into a white 3 - 4" dia. PVC pipe that goes under the edge of the concrete pool decking that attaches to one side to a the corner of my house (brick)and protrudes out around to the backside of my house. A couple of years ago I found a small dead snake about this same size on the carporch app. 4' from where I saw this one today. That one had something in it's mouth (frog, lizard, ?). I live in southeast Mississippi, Walthall Co. I've watched for snakes since we do have various kinds and I know that there have been 4 rattlesnakes killed very near here within the past 3 weeks, but have not seen any more like these. Could it be a pigmy rattlesnake? Is it poisonous? What should I do to get rid of it? I babysit and I am outside alot. Help! I saw a black snake this morning with white decorations on it. They weren't rings but like dots. Don't have a photo. I was scared cuz I have a 3 yr old, and I made my husband pick it up and throw it over the back fence. Please help me if you can identify this snake. My cat started crying at the back door and when I looked out the window at what she was looking at I saw a snake that was about 3 feet long, thicker than a hot dog and it was black from the head to about half way down and then it was tan. I live it the southern part of Alabama, any idea what kind it was? just figured out its a Western Skink! Couldn't see legs til I looked at magnified photo of it...don't believe these are usually found in these parts..more often in California. I found a baby snake with the back third a neon blue and the rest of it tan, light brown and black striped. Any idea what it is..or why the blue? I tried to catch a tiny - about 6 inches long - what I thought was a black racer, but it had a red dot on its head and got away. Is that what it was? Thanks. I found a black snake with blue patches on its underside...does anyone know what kind of snake this is, it was in my basement do I need to worry or not? My husband saw a snake in the pasture could not get a good look at it all he said was that it was big and when it took off it was going in a straight line with it's head up. Know this is not much info. but has anyone else see a snake do this. We live in south texas. @ MFC.....that sounds like a Hognose snake. I live in Texas & always have em in my yard. They will also PLAY DEAD. 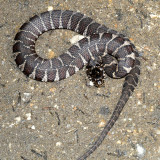 I have been seen a gray colored snake about 30 inches long ,lighter under belly, the head apered to have littel horns at both sides of the front top of the mouth area, and when aproached it raised up in a defensive position and the neck had a hood like you would see on a cobra, I have never seen this type hear in northern michigan,and I spend a lot of time in the bush,I would swear the neck of that snake went from 1 1/2 inches to 5 inches wide in a spilt second, what is it and are there more in this area???? I have just got a baby snake and i dont know what sort it is, It is bronze on top black under neath with a pattern. Does any body know what it could be? Can the rubber Boa be a darker brown then that I think I got one. it looks very similar. Vancouver WA. My husband found a snake,it was a solid color. The color was rather blue green, the underside was light yellow. It was about 3 1/2 ft. long, had a hog nose shaped head. it's circumfrence was about 6 or 7 inches. We don't know what it was. with this discription , can you tell what kind of snake it was? Last year I played host to a small (1.5 foot) black snake I assumed to be a black water snake. It was spotted with its head resting on the lily pads in my pond gardens, lapping up the tiny new born frogs like peanuts. This year, I have a SNAKES ON A POND movie playing in my backyard. Yes, there are goldfish in those ponds, but they've been there for 10 years. I have counted 5 individual snakes, all different, in the last week. A 3+foot Garter snake that loves posing for the camera, another 3+foot big brown and redish ringed beast that was mating with a little one on the island - black head but looks alot like a boa. Very shy. Why are all these guys showing up now? BTW- Two years ago and every year before that I had about 30 frogs in those ponds. I now have zero with the exception of tadpoles. Is this a new circle of life? 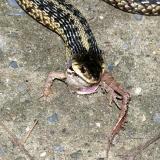 Snakes 5 Frogs 0. Any idea who the ringed beast is? A Northern Water Snake? And how big do these things get? I have my Dad's cane, a golf club, kitch tongs and a pillow case waiting by the ponds. I'm thinking I need to relocate them to a real wild pond up the hill. The ponds are right next to the pool and although I find snakes facinating -- my guests are freakin out. I found a 2 foot small light orange/brownish snake with a light creamish belly and large black semi-rings. It lives near a pond and very close where I walk my dog. Do I have to to fear for my dog? hi i found a snake in my shed 3 and a half feet long, with a grey back and a bright yellow belly. when i tried to move it he started striking at me his fangs were close to an inch long and it was very aggresive..ive never seen a snake like that around here befor can you give me an idea of what it is? HI. I found a snake here in Colorado and it doesn't look like a garter snake or any of the other snakes that I have found here. It is a light brown on the top of the snake and the bottom is a bright yellow. Can you please email me some info you might have on this snake? I would appreciate it. My grandmother found a black snake with white diamonds on it on the road. Could you tell me what it is? Found a snake on patio last night white belly brown square on back. Can you tell me what kind it was. Was about two feet long not that very big in side. Live in Montgomery, Alabama. Sorry, the black snake mentioned below was found in Greenville, SC. My son found a mostly black snake with lateral bluish lines climbing up a brick wall. Any idea as to what it was? The snake was about 4 feet long. Are there venomous snakes in central America that look similar to garter snakes? Hello, I live on the Eastern Shore and a neighbor of mine saw a brown snake with diamonds on it's back and had a hood like a cobra snake. I've looked and can't find any snake that resemble it. Could you please help. Hello All. Saw a snake this morning while cutting grass in the pasture. It was about 24" long, jet black with very bright red horizontal stripes, and a solid red/orange underbelly. I am in KY, so of course I can't find any picture that looks like it at all. Just wondering if anyone has idea what it was. Thanks. To Donna The snake you describe that flatens like a cobra is a hognose snake. I was fishing at my dock in Smith Mtn.Lake va.I was using blue gill as bait.Before I realized what I had on the end of my hook,I had caught a snake.The snake swallowed the hook, blue gill and 6in.of fishing line and never jerked my line or nothing.I was just reeling real slow trying to catch a bass that was right beside the snake.The sun was putting a glare on the water but I felt my line get real heavy and I thought "What in the World"I kept reeling slow and then saw that I was reeling in a snake not a bass. (real scary)I was able to get it in my yard and I killed it with my garden tool.I just would like to know what kind and if this snake is poisonous or not? ?Thanks for letting me be a guest and tell you my story. I found a dead snake in my drive way.Its little i thought it was a baby. Its brown and has little black spots alll along its body.I dont know what kind it is but i need to know what kind it is and if it is poisinous.i live in tennessee if that helps. I just killed a snake that looked like a rattle snake but it flattened it's neck like a cobra. This is in Tennessee. Anyone know what it is? Hi i have found a snake in The Atlanta,Michigan area it was a greenish brown color about 18 inches. it was around the first week of may a couple years ago. It looked like a cobra head the hood and stood up just like a cobra. But i knew it couldnt have been one because they don't live in Michigan. I have looked at pictures and searched on google for ways to find out what kind of snake this was. Can you please email me back with some possibilities what kind of snake this could be. Standing outside this evening we saw a very tiny snake. It was skinnier but longer than an earthworm and was white, coral or opaque in color - difficult to discern due to the darkness. I was surprised we saw the little guy at all because it was dark and he was so very tiny. What might he be?? Thank you for any help. im very sry about the repeated posts, something is wrong with my computer! i live in South GA. the snae was small, light in olor with black designs. he could make his head flatten out and could stand up...he was quite intimidating. im suprised he was out bcit was cool and windy out. what type of snake could that of been, my 13 month old was s close i was so nervous!! Yet another question for you. We are on a river in Eastern Washington State and last summer I watched an amber/ochre/yellow brown snake stretch vertically in the water while tail was wrapped around a rock under water. It remained almost motionless with only it's head facing upstream. length was approximately 2 feet to 2 and a half feet. No other coloration with a definite scale pattern. I watched it stay under water as well. I have Googled everything, but only come up with garter snakes with stripes for our region which this did not have. Thanks for any help! Love your picture gallery. hi i live in south africa and this morning i found a small black baby snake any idea what snake it might be. I noticed some red marks on my legs that looked like red dots. Are these red dots snake bites? I live in Silver Springs NV, and was cycling on HY 50 and I notice a very ''black and red'' snake, very black, I've looked for a picture and have not ID' it yet. Maybe you know? I don't think it had any yellow. Wished I would have had a camera' or a bag. Anyone let me know please. I saw a snake today while I was fishing, it was about 14" long it looked like a copperhead, except it had a HOOD like some asian snake, I have never seeen one like this. What could it be? I was visiting Banff hot springs in Alberta when I saw a small snake (3-4inches) that was beige with black spots. I know there are garter snakes in the area (warm all year) but it did not look like a traditional garter snake. Any ideas? Cheers. we found a anake in the basement of where i work which is someones house. im assuming its a baby as its only 8 inches long. its black with a tan belly and yellow ring around its neck. can u please tell me what kind of snake it might possibly be? we live in western pennsylvania. Found a snake on my lani it was small with a line on its back Fl. I have not found one like this in the pictures may be it was a baby snake it was 12 to 20 in. Found a snake on my lani it was small with a line on its back Fl. How do I tell the difference between a juvenile grey rat snake and a juvenile black rat snake? Found a snake on my prperty this morning. The snake is 30 inches long and grey with a yellow colored belly. I live near a creek in North Texas. Can you tell me me what kind of snake it is? I saw a snake with your descprition last night. A small 6 to 8 inch black snake with a red ring at the base of the neck. A friend said that he has them in his yard which is located in Magnolia Springs. After looking online I believe it to be a southern ringneck snake. They don't get much bigger. Sorry I forgot to mention, I am located in Southern Alabama about 8 miles from the Gulf. Like I said they appear 4-8 inches long being what looks like a black color but yet with a reddish tint to them and a black ring around the back of their necks, we have found of them in our work place, we are just curious to what types of snakes these babies may be, when in doubt where there are baby snakes there is a mamma or daddy snake not to far behind so with that being another reason I am curious to what type of snake this may be. I found a small black snake with a white ring around its neck on the side of my pool in florida tampa area. I have dogs and other pets. I cant find out what it is. I dont like to kill things but I also dont want to get killed. My pets agree.Could you tell me what it is.If friendly he can live in the yard. I have a snake under my front he had a frog in his mouth I made him drop it and he went back under the front of the house, he has small diamond like shapes on his skin I took a picture of him and wound like to send it to you, maybe you can tell what to do with this thing. We live in michigan. It is a baby snake but when he is scared he will flatten his neck and when that happens it's neck looks copper color so I thought it was a copper head but when you look at his head its eyes are round and the pattern on it body is brown black line then a light brown then a black line then brown again . Its head is blunt to me but I might be wrong if you need a picture send me a email so I can send you a picture. I found a small snake in my house -- I think it had brown/grey blotches, but the most distinctive feature was that the inside of its mouth was red! It was about a foot long, maybe 1/4 inch wide -- looked like a baby. We live in Florida, Palm Beach County. Any idea what it is? Thanks so much! I have a snake at my place in Maine. It is 2 feet long and very thin. It also has a silvery back and white belly. I can't find any pictures of one like it. As it reared up half it's length and hissed at me I don't really want to see it again but if I do I'd like to know if I should worry or not. 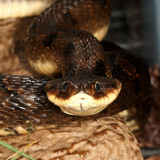 I know there are no poisonous snakes native to Maine but you never know what they neighbors have had and lost. Any help would be great. Thanks. I meant to state that we are in Northern California. Thanks again for your help. My wife found fat snake 18" long golden brown with what she believed to have a diamond shaped pattern with turquoise in the middle. Any one have a thought of what kind of snake this was.We have plenty of king snakes around but I was worried that this snake may be dangerous for our grand kids that stay with us. Hi.I live in Alabama and we have a lot of snakes.I saw one the other day that scared me to death.The snake was about 5-6 feet in length it was a pretty good size around maybe 2-3 inches girth.I have never seen a snake like this before.He was solid black, except the last few feet of his tail, it was a chocolate brown color.He was massive in size.He moved very fast and was gone in a flash.Do you know what kind of snake this was?I have searched the net far and wide to find one and have not yet.Please help if you can.I don't kill them,but would love to know what is living around me.I don't want to be afraid if he is harmless.Thanks so much. I went on vacation to eastern wa, i was walking aside the Columbia river when I saw a tiny snake maybe 4-5 inches long, it went into a small bush if shrubs but the color and design is what stood out. It was a bright neon-blue with a black head and a small white stripe seperating both colors. I've tried looking it up to find out what snake it was but havint found anything? Was in Florida in the orlando region and was going into my condo at night and on the brick pathway saw what I thought was a twig of a tree. It was light tan with what looked like brown rings going around it. What kind of snake is it. Recently I was at mom and dad's in western KY. With the help of my brother and mom we have a large garden going. While I was working on their tractor my brother was working in the garden, he called me out there to look at a snake. I am not sure what it was I have never seen one like it. It was solid brown no stripes or spots or anything. It had a bright yellow belly and was at least three inches diameter and about 3 foot long. What do you think it was? Hi Tom, I live in Florida and was tilling my raised bed garden when a little light bluish-grey snake appeared. I at first thought maybe it was an earthworm, just a strange color. But it definitely has a tongue like a snake. It has no eyes that we can see though. Can you please help identify. Just curious. I live in Northern KY and found a baby snake while pulling weeds and was trying to identify it. I was thinking it was probably a Garter of some kind, but can't find one that has a red belly. It has black diamond pattern across his back and is a gray color, but no stripes. Any ideas? If anyone cares... I have two dogs that were bit in the face by a copperhead a couple years ago. They were dazed and confused with some foaming at the mouth and lots of swelling but within 24 hours they were fine. This scenario played out again this spring already where two (not the same two) of my dogs got bit in the face again... Just like last time, same symptoms, within only a handful of hours they were fine. @char: It is rather difficult to tell if snakes are pregnant, but I have bred Garter Snakes for 6 years and the only way to tell, is the skin in between their scales will be constantly white, as if they just ate a big meal. Just remember to separate the mom from the babies within an hour after birth or she will probably eat them. If you have the father as well, separate him from both as soon as she starts giving birth. =3 good luck! Your pictures are so awesome I LOVE SNAKES but i know alot of people like my mom and her friends who HATE SNAKES well atleast a think your pictures and the snakes are awesome!!! I am also from Texas and my little dog have also fetched up a baby brown snake. Does this mean i have a snake living in my backyard. I have two small children and since then I have not allow them to go play outside because it is also the third time that the dog find one. I purchased/rescued a rattle snake from a guy last night. This guy is improperly caring for his snakes. Now I have this poisonous snake and I need to find out what it is. I am having issues finding anyone to help because it is poisonous. Can you help? Great gallery - very extensive and many species represented !! i was wondering what kind of snakes live in western washington. i live around alot of woods in tacoma washington and my fiance's lil girl loves to go hiking in woods.. I have a rubber boa that I're had for about 5 months, and I was wondering how often they shed, he has shed once already, and i dont know when to expect it next. I also cought a snake in Lewiston Idaho around july, and me and my mom are discussing weather or not it is a rattle snake, it was about 10-13 inches, light tan with black lines along the sides, square-ish shapes on the back, a band around it's eyes, and a defined pattern on it's head. plese clerify. thank you. what do black racers eat!!!? I live 1 hour north of NY City in a wooded area. there are many garter snakes around my house. I came across a baby snake no bigger than a small earthworm. It was dark in color, with white diamonds along its back. It also had a white spot on its head, other than the spot, the head appeared the same shape as a garter. Its tail was the normal slender tip similar to the garter snake. Can anyone help me identify this? Awesome pictures! Thanks to your Eastern Milk Snake photo, I'm more confident that we did not find a baby copper head, but instead a milk snake on our neighbor's door. I released the snake in a wood pile with lots of crickets, spiders, and chipmunks. I live in piedmont, n.c.- found a dead juvenile snake in the drive way. reddish-brown(bronze) body with bright yellow belly. I've never seen one like it before and need help with ID. I was cleanning out my shed in Alabama and found two or three snake skins. They are light brownor tan with black spots on the back. One was about 2 1/2 ft long. Can anyone email me with what kind of snake this was? stop killing these creatures that hav just as much a right to life as you all do.!!!!! I found two diff snakes. The first was tan with <><><> pattern on its back. Any idea what kind? 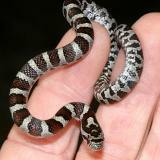 The second was dark in color with markings similar to eastern milk snake. It is young about a foot long. It coils and strikes out while the tail section vibrates quickly. Rattlesnake? Do all snakes coil and shake tails? Hi, I saw a long black snake (about 5 to 6 ft.long) with a large head about 5" long and 3 or 4 inches wide. The head had 2 red lines all the way around it. It had eaten a woodrat, so it was calmly lying there eating it's prey. I should have taken a picture of it. I had a brook near my house, so I figure it was a water snake. Could it have been a watermoccasin of some kind? My neighbor has been finding, via the cats mostly, very small gray snakes with white bellies and they are very uniform in color. We live right in Austin, TX. I have relocated the ones that are still alive to my yard and thus far have found them to be fairly docile or at least in shock from the cats. I don't see anything that looks like them on this page . Could someone assist me further? I saw a Teal and Black snake in my flowerbed. Now, I don't care for snakes, but the teal was awesome along it's belly with the black. A "pretty" snake. What kind is it? I live in Florida on brackish Lake Harney and it looked like it had just eaten something large, as there was anoticable bulge as it slid along. i was out back and i saw a small, like 1 and a half foot long, thin baby snake. on the bottom half, it was grayish- brown, and on the top half it was the same color, except speckled on the sides. the speckles looked like a cheetah's. it was scared for its life and was trying frantically to figure out how to get out of the screen so i left to get a camera and when i got back thirty seconds later it was gone. i looked everywhere and i couldn't find it. does anyone know what kind it was? Today I found what I'm sure is a small brown snake (Storeria dekayi) in N. Central Massachusetts. It had a very beautiful design on its head and I have not seen such a design in any of the photos I've seen of brown snakes. Any ideas? Thank you. I found a baby snake in my yard, I live in WV. I don't know if I killed it with my lawn mower or if my cats killed it but I am concerned that it might be a copperhead. It had a brownish color top part of its body, the underneath was red. The head was gone and its tail looked blunt. Actually I thought it was a nightcrawler when I first saw it. We have a large pile of logs near where this snake was laying. My husband didn't think it was a copperhead but my son does. Concerned I might need to be a little more careful in catching nightcrawlers............What do you think????? Fabulous pics! Great dedication! Hope you're still at it! Hi. I was in Orlando recently and one morning I found a small snake by the pool. It was about 20 inches long and thin. Color was light brown kinda zig-zag pattern on the back and it had two large white dots on the head. When I tried to "lead" it out of the pool area it attacked several times before it slid into the pool and started swimming around, trying to get up. When I tried to lift it out of the water, it attacked while swimming, which I found a little strange, since I didn't know that snakes could bite while swimming. I wonder what kind of snake it was, hope somebody can help me. First of all, great picture gallery. I live in Caliente Nevada and my job takes me on a lot of dirt roads. Today, while crossing Coal Valley, about 120 miles north of Las Vegas near the Lincoln-White Pine county line, I stopped for a "break" and saw a small greenish snake a few feet away. I always stop and move snakes off of the road and as I approached this one, it reared up and began a rapid, writhing display straight at me. It was nearly as green as an Eastern Sm Green but with a brilliant red belly like a Northern Brown. Could a Northern Red Belly be found in the high desert of Southern Nevada? I see Gopher snakes and rattlers all the time and an occasional Coach-whip but this was a real surprise. I know you're probably loving the questions right now. I live in Florida and on my outdoor patio today I bent down and put my face into a tiny little all black moving twig. At first, I thought it was a worm but it moved in the curving S pattern of a snake. Light shined off of it but the snake was all black. His rear actually looked larger than his head. I thought he might grow out of this. He was not aggressive toward me but most living creatures aren't--no matter how wild. What do you think . . . baby racer? I found a black snake with a red ring around it's head at the beginning of it's body. I think it may be a Ring snake, but I am not sure. I live in Sarasota, FL. We live in Colorado and we're technically in the plains though the mountains (Pikes Peak) are only about 8 miles from us as the crow flies. The kids and I were walking around the block and the 2 year old ran right by a little snake. We stopped to look at it (we catch garters in our yard all the time), but I told the kids not to touch it. It had markings with which I was unfamiliar. After looking through your pictures, I think it was the Hopi species Western Rattlesnake. Would that snake be right on the sidewalk catching some sun in a residential area? I found a little snack about 4-5 inches long and it look between a ribbon a nd a garter snake but he has some weird black and yellow makings around its neck. I cant find a picture of one online anywhere. Do you have any idea what kind it might be? My dog killed a snake on Saturday It was blackish grey with green octagon shapes on his back he was 2 foot long and was striking at the dogs. We live about 40 miles east of atlanta. Could it be some type of garter snake? Dianna, I would like that too, but I haven't found a Copperhead yet. Maybe next spring, if I'm lucky. I WOULD LIKE TO SEE A PICTURE OF A BABY COPPERHEAD. Hi People, I need some help. We killed a snake infront of my apartment here in VIrginia.I have a phobia of snakes. I mean the worst phobia and I cant rest until I find out if this snake is poisonous. It was a baby, meaning it was only 7 inches at the most, but he was brown-army green and he is rough not shiny looking . I have a fear that the mother snake is somewhere around these apartments are easy to slide into LOL there old and there are cracks everywhere . Help someone and tell me what kind of snake this is so I can sleep I have been up 48 hours . I am trying to identify a particular snake. I do not have a picture and really do not know its region. 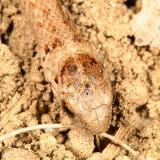 The snake is reddish brown with the belly being similar in color, the inside of its mouth is white, and it has no visible teeth. I believe the snake will grow to lengths of 5 feet or better. Any thoughts, or even better pictures? I realize this is not a lot to go on. Please copy your post to e-mail or at least notify me when you respond. Paige, it sounds like your snakes were ring-necked snakes, or maybe a southeastern crowned snake. I forgot to mention I live on a lake. While playing outside in eastern alabama, I saw a brown baby snake (about the size of a worm) with a white ring around its neck. I also saw a medium size brown snake (about 15-20 inches long) nearby. Do you know what species it may be? Kat, as far as I can tell, the only venomous snake in Washington state is a Northern Pacific Rattlesnake. So if you see a snake without a rattle, chances are that it's harmless. Maybe what you described as black with blue stripes is a racer, or garter snake. It's hard to say without seeing it. Hi, My husband was in the back chopping down foliage and such, when a medium sized black snake with blue stripes slithered out of the bushes. One of my kids tried to pick it up and I got very worried because there might be more snakes in my yard and i don't want my kids to get bitten. My husband told me since we live in Western Washington there are no venomous snakes. But i still want to know what kind of snake it is just to be sure. I'm from the south and i know what can happen with snake bites. Please help. Kay, It's hard to tell for sure what snake you have around your pool, but my guess would be a milk snake. They're found from Texas north to the Dakotas, and all the way through the east coast, and sometimes they'll shake their tail when they're nervous. Jennifer, the closest I can come up with for your snake is a Queen Snake. Tom, in my yard in West Alabama (Marengo Couunty) I found a color combination of a snake I had never seen before. It was smooth scaled, dark grey in body color (color of a tree branch) but with some lines as if painted with a watercolor brush of darker grey vertically down the body, then a teal (not kidding) thin line that divided the top of the body from the belly. The belly was yellow. I have no idea what shape the head was, as my husband killed it before he noticed. It waws about 24 to 30 inches long. The thickest part of the body was larger than a half-dollar coin. Any idea what it is? TO MOVE HIM AWAY FROM MY GRANDCHILD. I HAVE HAD LITTLE SNAKES LIVE UNDER OR BESIDE MY INGROUND POOL YEAR ROUND, BUT I NEVER SAW ONE LIKE THIS. COULD THIS MAMAUL BE PREGNANT? MOVED VERY SLOW. IT ALSO HAD A PIANO LOOKING, BLAKE AND WHITE BELLY SCATTERED ON THE BELLY. WHAT DO YOU THINK THIS WAS? KAY@KAYSINTERIOR.COM MASS ON NH BORDER NICE SHOW YOU HAVE HERE. I love the rattler, he eats my kittens, hurts my dogs, horses, and cattle, But I love him, and I give him a sporting chance, I use a 22 instead of a shotgun, when I pull the trigger. hello, i found in my house the other day a baby snake, it had markings sort of like a carpet snake but it was like i light brown. i thought it could just be a carpet snake. it seemed very aggressive. can you tell me what type of snake is this? i found a tiny black snake (no longer than your thumb) in our boat under a pile of leaves. i was wandering what kind it was. I found a snake on the coastal rocks in Acadia National Park that looked like a smooth green snake, but it had rectangular blue patches on it. Does anyone know what it was? A friend and I stumbled upon a snake on northfield Mountain in Irving, MA that I've IDed as a milk snake... BUT it definitely made a rattling sound... Am I crazy or does it have a rattler? Is there another species that looks like the milk snake that is a rattler? Tay, black racers don't have any venom. They'll bite if you pick them up, but other than a few scratches they leave, there aren't any other bad effects. The only watersnake I know of in New England is the Northern Watersnake. Cottonmouths are a more southern species. Aren't there Cottonmouths in New England? Katie, if the snake has rough scales, then it's a red-bellied, and if the scales are smooth, then it's a brown phase ring-necked snake. The only venomous snakes in New England are timber rattlers, and copperheads, and they aren't in any part of Maine. All the red-bellies and ringnecks I've found, none has ever tried to bite, and they will put out that musk when scared. hey, I live in maine and im 13. Well I found a snake simmilar to the brown phase Red-bellied Snake. Very simmilar, though my snake I caught seems a little different. I was wondering if you might think its venomous... I dont need anything killing me in my sleep, but 'Baby' (my snake) is very good but shy and stuff. he/she doesnt like my kitty though but doesnt do anything. Hi I have encountered snake eggs but i'm am not sure what kind they are they sort of look like smooth greens but they also look like eastern hognose eggs to i am just trying to find out if you could help that would be great. Impressive work Tom! Good variety of snakes with ID's. Many great shots. Wow you see things more often then I do! Everytime I encounter a snake, it runs like heck before I get my gear prepared. excellent shots , good work . good snake shots, where were these shot?